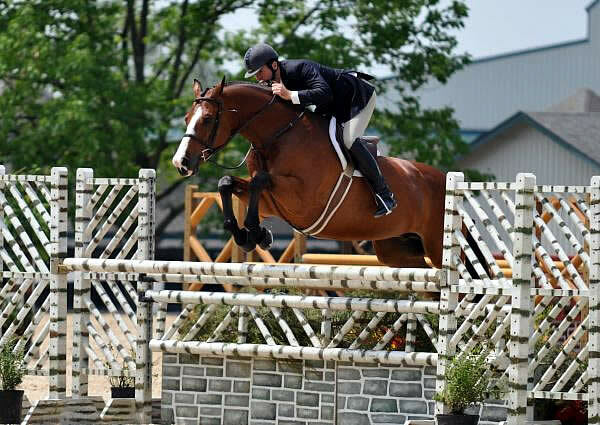 Lexington, KY – May 13, 2010 – The second day of competition for the professional hunter divisions concluded today at the Kentucky Spring Horse Show located at the world-class Kentucky Horse Park. In the Stonelea Arena, the hunters competed for their division championships right before a short but strong rain shower rolled through. Hunt Tosh was the name to beat today. He had numerous championship wins including the Green Conformation Hunters, aboard Trade Winds; the Regular Working Hunters, aboard Lonestar; and the Regular Conformation Hunters, on Tasty. Lastly, Tosh added a reserve championship in the First Year Green Hunters aboard Good Humor. Today’s competition began with the First Year Green Working Hunters followed by the Green Conformation Hunters, the Second Year Green Hunters, the Regular Conformation Hunters, and then finally the Regular Working Hunters.